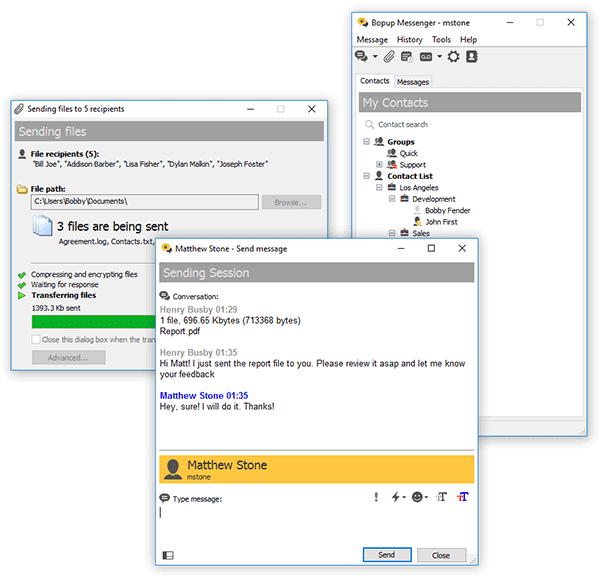 With this messenger, you can easily connect users from all other offices and locations to one IM workspace and exchange files, urgent and extended messages with links, font and color formatting and emoticons, and can receive assigned files from the IM server. Organize your personal contact list that is accessible to you from any workplace and see who is online and available to communicate among your contacts. No user experience and skills are needed to use the program. The smart and comfortable user interface with advanced usability options and popup notifications allows you to join the IM network in a few mouse clicks. The messenger completely supports the Terminal Server/Citrix environment and can be used simultaneously by multiple users on one computer. Bopup Messenger can automatically download and install updates from the IM server. The centralized client/server architecture offers complete and flexible management for controlling your IM infrastructure. The central server logs all user activity and archives all messages and transfers. It allows you to manage messaging groups, users' contact information and permissions to send and view other users, assign and distribute important files and documents to users. It is easy to import user accounts from Active Directory (LDAP). Several authentication modes are supported: Simple, Windows Authentication or login/password pair.